It was more good news for UK iPhone owners last night, as web service TVCatchup added another 17 Freeview channels to it’s iPhone streaming service. 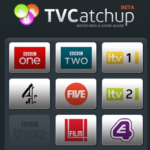 TVCatchup have been offering free-to-air Freeview channels streamed over the internet since October 2008, and this October launched a beta web page optimized for the iPhone, initially streaming only 11 channels. Now many other great channels have been added, including BBC Four. They’ve announced plans for this service to be launched as an official Apple app in the near future, and the beta service shows iPhone owners some of what they can expect from a full service when this hopefully happens soon. The streaming quality on the iPhone seems excellent when I’ve used it (and much better in my view than the recent Sky Sports official streaming app), although as is to be expected with any beta trial, users may encounter some errors from time to time. Rest assured TVCatchup will be ironing these out as they may crop up. It’s also worth pointing out that although billed as ‘live streaming’, there is a very slight lag (I’d say from 30-60 seconds), but this is inherent of Freeview anyway, and also a feature of the Sky Sports app. The links to the full web service and iPhone beta page are below, and the full channel listing for iPhone now is – BBC One, BBC Two, ITV1, Channel 4, Five, ITV2, Five USA, E4, ITV3, ITV4, More 4, BBC Three, BBC Four, Fiver, Film 4, BBC News, CBBC, CITV, Channel 4+1, E4+1, Cbeebies, 4 Music, More 4+1, ITV3+1, Film 4+1, BBC Parliament, BBC Alba and Men & Motors. It works over Wi-Fi or 3G, although OS 3.0 or higher is required. This entry was posted on Saturday, December 5th, 2009 at 12:44 pm	and is filed under News, TV & Film. You can follow any responses to this entry through the RSS 2.0 feed. You can leave a response, or trackback from your own site.